My Soundcloud Mix May 2016 is available! My Soundcloud Mix Series is back with a 1 hour mix which features 14 fresh tunes released on Infrasonic Pure or are Bootlegs! It features tunes and remixes by artists like Ultimate, Moonsouls, Sean Mathews, Adam Nickey, Novaline and many many more! Stream+Download enabled, enjoy! Tic Tac Trance #101 Replay available! Do you recognise artist names like Stenna, Kamil Polner, Alt+F4, Hammer & Bennett or Nu NRG? Are you ready for a Trance Classics Mix? 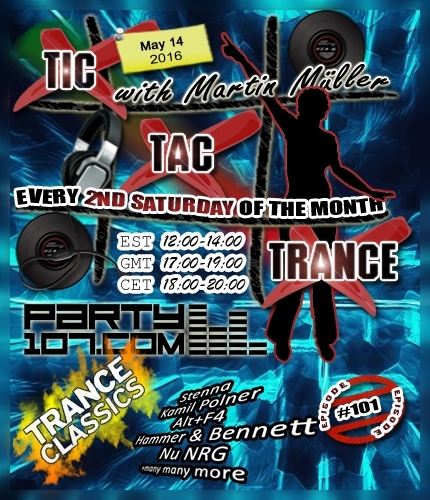 This special Trance Classics Episode #101 of Tic Tac Trance will air on May 14 2016 on Party107.com. You can expect for this show a 2 hours uplifting underground trance classics mix! Make sure to tune in!